Only redeemable online for Soft Enamel, Hard Enamel, Premium Soft Enamel, Premium Hard Enamel, Die Struck and Rainbow Plated Badges. Printed on the reverse of pin badges. If it is your own logo, supply the file with design. Can not be redeemed in conjunction with any other offer. Sound ok? Great! Upload your backstamp design (if required) with your order. If you’re not ready to upload your design, tick the ‘order without file’ option to get started with your order! 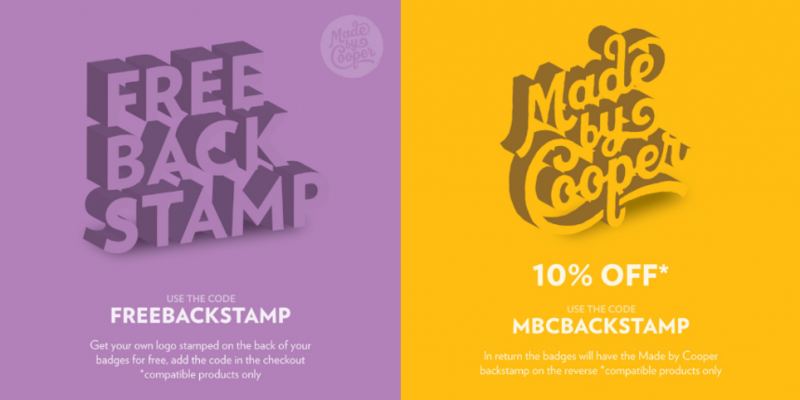 You do not need to tick the backstamp option, just use the code required in the shopping cart and you’re good to go!